First things first. You’re probably wondering why we aren’t Amish anymore. Well, it turns out that we never actually were Amish. And based on our use of technology, we were barely even Baptist. We just weren’t ready to give up our modern conveniences. We tried, but have you ever tried texting with a pencil and paper? Awful. The day we packed up the bonnet and beard was a sad one. How were we going to get by as English in an Amish friendly economy? But when one door closes, another door opens. Or in our case, the curtain to our brand new magic show – “Lonnie, Sara, Coyle, and Kiddie’s Amazing Magic Hour of Wonder Hour” opens. The idea of getting into magic started when we saw another magician pull a quarter out of someone’s ear. 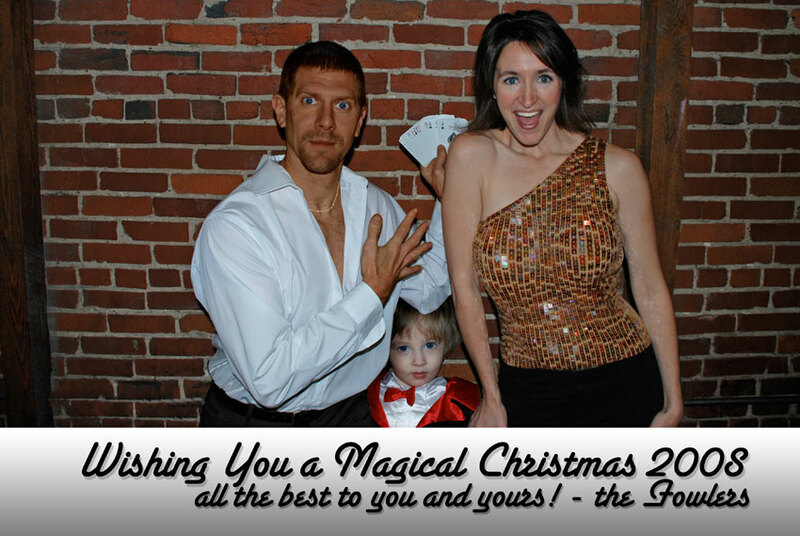 We thought “if magicians can pull money out of someone’s ear anytime they want, imagine what they can do with a 401k!” The easy money that awaited us was just a few sequins and a fake tan away. It hasn’t been easy, though. Lonnie still hasn’t figured out this quarter thing. Apparently there’s some sort of trick involved. The good news is that he started working on other tricks, like how to fill up an entire hour-long magic show without any magic. showmanship. We’ve tried to tell him that crying isn’t good showmanship. 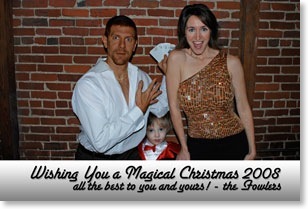 Who’s ever heard of a fussy magician (other than Siegfried and Roy)? Many have wondered, “What does a dog do in a magic show?” We’re not sure. We’re hoping whatever it is, is great. So far, most theaters don’t want to book a magic show where the dog doesn’t have a defined role. Nobody wants a canine prop. that the added posing will bring something to our show that the others lack, since our show lacks magic. Be looking for “Lonnie, Sara, Coyle, and Kiddie’s Amazing Magic Hour of Wonder Hour” to come to your town in 2009. We’re trying to promote our show as family friendly. Although, Sara has to cut back on all the swearing and some of the gesturing. We’re guessing that by the time Lonnie figures out the magic, Coyle stops his fussing, Kiddie does at least something, and Sara can act like a lady, we’ll have one great show lined up. • Most of the shots were taken on the stage, but they didn't quite look right. • Originally, Coyle was wearing a top hat that was meant to cover his face. We had made the top hat out of a bucket, some cardboard and felt. • Lonnie's tan was all done in photoshop, as was Sara's teeth whitening and other "enhancements".